Disability service providers do invaluable work in our community. It’s therefore vital for the whole community that you, and the work you do, is properly protected through insurance. It is a fact of life that accidents and mistakes can happen and unfortunately these can sometimes have legal, reputational, regulatory and/or financial consequences. Insurance policies are designed to protect individuals and organisations when they need to make a claim. These claims can be anything from a lost laptop to a complex liability matter. Some services that you deliver to clients are riskier than others. In order to gain a clear understanding of your risk exposures, it’s sensible to work with an insurance broker with expertise in providing risk management advice and appropriate insurance solutions. You should always consider if the insurance is suitable for you and read the Product Disclosure Statement (PDS) and Financial Services Guide (FSG) before buying insurance. How do I identify risks? 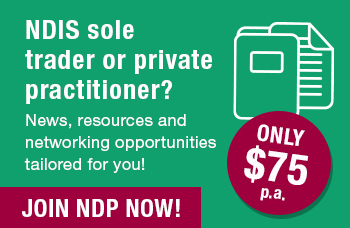 NDP encourages members to research and obtain quotes from a range of insurers before deciding on a product that best suits your individual needs. To get you started, Gallagher has created an insurance product specifically for sole traders in the disability market and exclusively available to members of National Disability Practitioners (NDP). Gallagher’s FSG is available here.